"Sa dinami-dami naman ng pwede kong mamana sa aking mga ninuno... bkit ito pa?" Nothing more I can do except to live with it the rest of my life. My severe asthma attacks started when I was pregnant with my youngest. I used to have Urticaria or hives when I was single but when I got married, it evolved into another form of allergy called Atopic dermatitis. It is a very common, often chronic (long-lasting) skin disease that affects a large percentage of the world's population. It is also called eczema, dermatitis, or atopy. Most commonly, it may be thought of as a type of skin allergy or sensitivity. The atopic dermatitis triad includes asthma, allergies, and eczema. There is a known hereditary component of the disease, and it is seen more in some families. The hallmarks of the disease include skin rashes and itching. The word "dermatitis" means inflammation of the skin. "Atopic" refers to diseases that are hereditary, tend to run in families, and often occur together. In atopic dermatitis, the skin becomes extremely itchy and inflamed, causing redness, swelling, cracking, weeping, crusting, and scaling. Dry skin is a very common complaint and an underlying cause of some of the typical rash symptoms. Although atopic dermatitis can occur in any age, most often it affects infants and young children. In some instances, it may persist into adulthood or actually first show up later in life. A large number of patients tend to have a long-term course with various ups and downs. In most cases, there are periods of time when the disease is worse, called exacerbations or flares, which are followed by periods when the skin improves or clears up entirely, called remissions. Many children with atopic dermatitis enter into a permanent remission of the disease when they get older, although their skin may remain somewhat dry and easily irritated. Multiple factors can trigger or worsen atopic dermatitis, including dry skin, seasonal allergies, exposure to harsh soaps and detergents, new skin products or creams, and cold weather. Environmental factors can activate symptoms of atopic dermatitis at any time in the lives of individuals who have inherited the atopic disease trait. The CAUSES are still unknown, but the disease seems to result from a combination of genetic (hereditary) and environmental factors. There seems to be a basic hypersensitivity and an increased tendency toward itching. Evidence suggests that the disease is associated with other so-called atopic disorders such as hayfever (seasonal allergies) and asthma, which many people with atopic dermatitis also have. In addition, many children who outgrow the symptoms of atopic dermatitis go on to develop hay fever or asthma. Although one disorder does not necessarily cause another, they may be related, thereby giving researchers clues to understanding atopic dermatitis. While emotional factors and stress may in some cases exacerbate or initiate the condition, they do not seem to be a primary or underlying cause for the disorder. In the past, there was some thought that perhaps atopic dermatitis was entirely caused by an emotional disorder. I have read several articles about this illness but the TREATMENT may vary depending on the type of allergy and what allergen greatly affect each condition. • Atopic dermatitis is a type of eczema. • The skin sensitivity of this disease may be inherited and genetically determined. • The patient's skin may be "super sensitive" to many irritants. • Dry scaly patches develop in a characteristic distribution. • Itching varies but may be intense and scratching hard to resist. • Scratching can cause skin thickening and darkening and lead to further complications, including bacterial infection. • Extremely dry skin can break down and ooze or weep. • If the itch can be controlled, the rash (which is aggravated by vigorous scratching) may be more readily contained. • Treatment of atopic dermatitis is centered around rehydrating the skin with rich moisturizers like Vaseline and cautious use of topical steroids to reduce inflammation and itching. • Oral antihistamines are often necessary to break the "itch-scratch" cycle. • Since secondary infections can aggravate the rash, topical or oral antibiotics may also be occasionally indicated. Yes, I have maintenance... moisturizing lotion and soap with oatmeal, when my attack is severe I have to apply clobetasol ointment on the affected area. sad to know you have the atopic dermititis .. will be passed on to your children through genetics... just maintain a hygenic environment and away from any thing that would trigger itchiness .. Thanks for that advice. I'm almost have OCD... dirt and dust really irritate me! I used to have eczema which was triggered by stress and it was really bad. It took a while to get past it but through antibiotics, ointments and proper soap, I was able to overcome it. Also, some type of food are also triggers for skin asthma like chicken and scaly foods. I know I will suffer from this dilemma for life. You're right! STRESS is the major factor that triggers the itch. Not so much of food... I can eat seafoods. The truth Ms Marie... it's part of my routine everyday. Applying moisturizer more than 10 times a day. aayyyy!!! i know how hard it is to have skin reactions to whatever it is irritating them... have you tried supplements? hmm... how about evening primrose oil? I also have this condition. Boy, it can be nasty when it's triggered. But like Franc, with the right medication and skin cleansers, it can be treated. And I also agree on it being genetic because one of my kids has a tendency to have skin rashes, too. Now that I think about it, my grandmother had it, too. 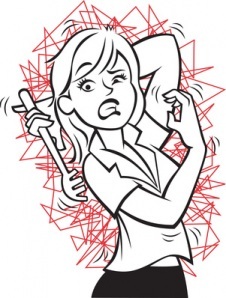 I hate that kind of discomfort the itch that you really cannot scratch.. is there a cure or a remedy for this? some says most of the allergies are also induced by diet, I wonder how true is this. ALso another school of thought suggests that skin irritation has something also to do with our unexpressed real and physical irritation of people that gets out in our bodies, wonder the truth in these ideas? My daughter has it its very common among babies and usually diminish when they grow up I hope, just avoid scratching it I know it becomes very itchy sometimes and keep your skin moist..they said vinegar helps but dunno though..never tried it.. I have been dealing with psoriasis since I was 10 years old. It has limited my activities to a certain degree when I was younger but I have learned to manage it just like the stress that seems to cause it. Ayks! I also have a skin condition. I need to use lotion always since it easily gets dry. my eldest son used to have skin asthma..good thing he outgrew it and no longer experience. Awww.. sad to hear this story. I hope you could find a cure for your skin. I have some skin abnormalities but I don't think this is one of those mentioned. I want it also checked by a doctor since my kids got them too. I have skin asthma and was planning to make a post about it. I tried a lot of cream every summer coz i only have it during summer time. There is no treatment for it so i have to deal with it every summer. skin asthma can be very annoying. i've had a friend who suffers for it. Some people do get lucky for having a good / perfect skin condition while others have to rely on medication to avoid breakouts or lots of skin care products. hope you'll find a fix soon. if it is really annoying already, the best i can think of is to seek medical advice from a specialist... hope you finally get free from it. Yahweh bless. If you have skin asthma there are cases that it limits you to do other things that may trigger it. My cousin have skin asthma and she have medication creams ready when the asthma attacks her. this information would greatly help those suffering with similar allergy and condition... Yahweh bless. I have this too but I have learned how to live with it....besides Atopic people belong to the top 10% in the intelligence quotient.